Read the Energy Savings Tips Sheet for Foodservice Operations. Commercial refrigeration accounts for as much as 1/4 of all energy consumption in a foodservice operation, but it's not the only way to save on energy costs. 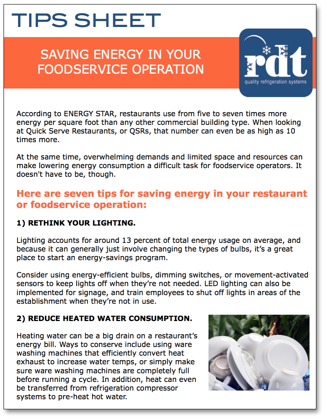 Take a look at this free Energy Savings Tips Sheet from RDT, and discover seven tips for saving energy in your restaurant or foodservice operation. Is your lighting system up-to-par? Is your staff trained to save energy? And how do your refrigeration costs affect your energy bill?